Families of the four Marine reservists killed in an apparent midair collision say they take comfort from knowing the men died flying in the line of duty. behind his beloved Harley-Davidson for the mission. One was a tough guy who melted when his son arrived. One was a motorcycle-riding patriot who looked forward to doing his part in war, if it came. One was a squadron commander who enjoyed juggling his civilian and military jobs. And one postponed a family in order to achieve his goal to fly. Brought together by their commitment to the military, the four Marine Corps reservists, killed Wednesday in an apparent midair collision, leave behind grieving families who said yesterday that, despite their tears, they take comfort from knowing the reservists died flying in the line of duty. The crash happened while the Camp Pendleton-based reservists were on a night reconnaissance flight in Texas for a U.S. Border Patrol anti-drug mission. A detachment of 53 Marines from Marine Light Attack Helicopter Squadron 775 were participating. The unit will return home this weekend, officials have said. Major Steven G. Palombo, 36, wears a serious expression in many photos adorning his Carlsbad apartment, where his wife, Hiroko, swings between smiles and tears as she talks about him. Married in 1992, they have a 2-year-old son, Cameron. Behind the stern looks, there was a big heart, said Palombo, who is 36. "I want everyone to know my husband was a wonderful guy," she said, adding that she tells the girls at the school where she works as a student adviser to find a fellow like him. "When we had a baby, nobody really expected Steven was going to be this sweet daddy. He's a big guy and tough-looking," Palombo said. "But he just loves Cameron. When people see Steven spending time with Cameron, you just find yourself smiling." Palombo and the others were flying in two AH-1W Super Cobras, which are two-seater gunships. They departed Jan. 17 for a two-week mission with a Pentagon task force that assists civilian law enforcement agencies. Camp Pendleton will salute the pilots with a private memorial service Wednesday on base. Captain David Clarke Cross, 34, gladly left behind his beloved Harley-Davidson for the mission, said longtime girlfriend Heather Rand. The two lived in Carlsbad. "He didn't understand how somebody couldn't be patriotic for this country," said Rand, who recalled how Cross sometimes wore a star-spangled bandanna when he rode his bike. Cross "was actually looking forward to possibly going to war, if that was the decision that President Bush made," she said. "He wanted to do his part for this country." He did most things with a gung-ho spirit, Rand said. "Every person he talked to, he made them feel that they were really great, and so he attracted a lot of people." Cross will be buried in Virginia's Arlington National Cemetery with military honors. Lieutenant Colonel Robert J. Theilmann, 47, who lived in Oceanside, saw his duties as squadron commander increase after Sept. 11, 2001, when reservists were called on more than before. He embraced the additional duties, said his older brother, Richard Theilmann of Queens, New York. "I know some reservists had difficulty integrating their business and private life with all the additional call-up," Theilmann said. "He was able to juggle both family and work. He really was able to juggle all those balls in the air and keep things going." Robert Theilmann, the squadron commander, served as chief executive of his son's heating and air-conditioning company. He also raised Shetland sheepdogs, his brother said. He and his wife of 20 years, Barbara, also bought and rehabilitated homes. "You guys lost a fine citizen," Richard Theilmann said. Major John M. Walsh, 36, had just bought a new condominium in San Marcos. A single man, he already had filled his garage with mountain bike, surf board, backpack and a bulletin-board full of entry numbers from road races he completed. Walsh was full of life, said his father, Larry Walsh, of Palm Springs, and flying was his love. "He had wanted to be a fighter pilot since he was 8 years old," Walsh said. "He had goals and he accomplished them. That's one of the reasons he wasn't married. He was focused on what he wanted." After leaving active duty, he got a master's of business administration at the University of San Diego and worked as a project manager for a Poway electronics firm, in addition to his reservist duties. He will be buried at Fort Rosecrans National Cemetery in Point Loma. Everyone echoed the thoughts of Rand, who said she takes solace knowing Cross went down flying. "I'm just happy he died doing that. If he were to die, I'm glad it was that, because he loved flying," she said. Some said they looked forward to the results of a Marine investigation into the cause. Others didn't. "They will probably put blame on somebody, but I don't care about that," Walsh said. "They were all experienced pilots. They were all doing the best they could." But Palombo wants to find out all she can. "I want to know a lot because I have to tell his son, when he's ready," she said. "When Cameron's old enough, I have to tell him everything about his dad." STATE COLLEGE - A State College Area High School and Penn State graduate who died in a military helicopter crash was remembered Friday as a dedicated Marine who loved to fly helicopters and as his younger brother's hero. David Cross, 34, was one of four Marine reservists killed when two helicopters collided Wednesday night during an anti-drug patrol along the Texas-Mexico border. He was a 1987 graduate of State College Area High School and a 1991 graduate of Penn State, his family said. "My brother was a great guy," Dan Cross, 26, a student at Columbia University, said Friday evening from New York. "I know that might sound contrite. But it's the truth. He was always there for me. "He was my big brother," said Dan Cross, also a State High alumnus, "and, in a lot of ways, he was my hero." "He did love to fly," David Cross's father, also David Cross, said Friday from his home in Reston, Virginia. "Throughout his career, he kept taking assignments that were flying assignments." David Cross was born in Washington, D.C., and grew up in Norfolk, Virginia. The Cross family moved to State College in 1986, when the father took a job at Raytheon. David Cross enlisted in the Marines after enrolling at Penn State, where he was a member of Pi Kappa Alpha fraternity, his father said. "He really got serious about his schooling at that time," his father said. "From then on, he did really well." After graduating from Penn State in 1991, Cross entered officer-training school. "That's where, David told me, he learned to sleep in the mud," his father said. David Cross subsequently secured one of 10 slots to enter the Navy's air school in Pensacola, Fla. He later trained to fly Cobra helicopters at the Marine Corps' Camp Pendleton in California. "Flying was what he wanted to do," said Kathy McClintic, David's stepsister, who works at Penn State's Applied Research Laboratory. "It was kind of his dream." David Cross also leaves behind his mother, Gwynn Cross, of San Antonio; his step-mother, Linda Cross, of Reston; and his girlfriend, Heather Rand, of Carlsbad, Calif.
"He overcame a lot of adversity," Dan Cross said. "When he decided to become a pilot, they told him there was a 1 percent chance of him making it. But he really worked to make his dream happen." In October 2002, David Cross left active duty and a career that had taken him to Japan, Russia and the Persian Gulf. He joined the Marine Corps Reserves and was working toward a career as a commercial pilot, his father said. The elder David Cross, who now works at Lockheed Martin in Virginia, said his son will be buried at Arlington National Cemetery will full military honors. A memorial service will be held next week at Camp Pendleton for all four pilots who were killed. As an investigation into the crash continued Friday, security was tight at a remote state park near the Rio Grande where witnesses reported seeing the two AH-1W Super Cobra helicopters collide, according to wire service reports. 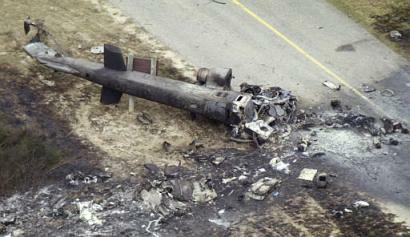 The victims were members of Marine Light Attack Helicopter Squadron 775. The detachment of six helicopters and 53 Marines, deployed to Laredo, Texas, on Jan. 17, has been ordered to return to Camp Pendleton, the Marine Forces Reserves said. Dan Cross said his brother was heading up the Texas mission and was piloting one of the Cobras when the crash occurred. "I'm not sure what happened down in Texas," Dan Cross said. "But he was a good pilot." 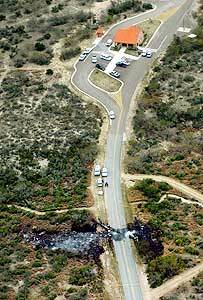 Two Marine helicopters slammed into each other late Wednesday (22 January 2003) during a nighttime counter-drug operation near the U.S.-Mexico border, killing four Camp Pendleton- based reserve aviators, officials said. The AH-1W Super Cobra helicopters collided near Zapata, Texas, about 9:30 p.m., lighting up the sky with fiery wreckage, witnesses said. The aviators were wearing night-vision goggles and infrared sensors, but it is unclear what role, if any, the devices played in the crash. Lieutenant Colonel Robert J. "Ramrod" Theilmann, 47, a Pendleton flight instructor and commander of the 300-member squadron, dubbed "the Coyotes." Major Steven G. Palombo, 36, whose wife just gave birth to a daughter. Captain David C. "Moon Pie" Cross, 34, who remained active in the Marines because he couldn't find a job flying commercial airliners. Major John W. Walsh, 36, another expert pilot. All lived in San Diego County. "This is a huge loss to our family," said Sergeant Major Robert Gallagher, a reservist with the Coyotes and a Fountain Valley police detective. "Our squadron has received numerous awards for safety, which makes all of this incredibly ironic." The two-seat Super Cobra attack helicopters have a good safety record, having served in combat during the Persian Gulf War, experts said. The four Marines had been deployed to work with Joint Task Force Six, a military/law enforcement drug interdiction team. It was not the first fatal crash involving the task force. 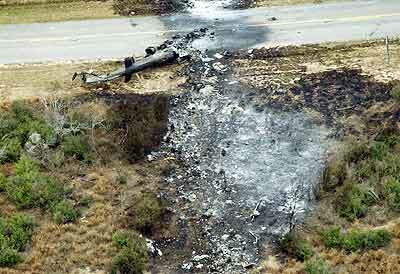 In 1995, an Army pilot was killed during a similar surveillance mission in Arizona. Defense officials say a door on the pilot's OH-58C helicopter came off and he lost control of the aircraft. That crash also occurred after dark. Organized in 1989, the task force teams military resources with local and federal law enforcement to stop drug smugglers. Dozens of the group's missions were worked by reservists from the Pendleton-based squadron. Never before have the Coyotes lost a Marine. Theilmann had been a pilot for more than 20 years and worked as a Cobra flight instructor. "He was pretty much a military-career kind of person," said his wife, Barbara. "He wanted to fly. He died doing something he wanted to do. If there's any way a pilot can go, this is it." Barbara Theilmann said she always tried not to think about how dangerous her husband's job was. "There's a lot of things the military does on a daily basis, and no one's aware that they're involved in," she said. "Families get left behind. It doesn't take a war." Funeral arrangements are pending, but Barbara Theilmann, who spoke of her husband in the present tense, said he wanted a full-dress sendoff. "He's such a military person, he wants to have the full military funeral, complete with full colors and a flyby of Cobras in the missing-man formation," she said. Cross joined the Marines after graduating from Penn State University because he always wanted to fly. "He's a pilot and always wanted to be a pilot," said his father, David Cross of Reston, Virginia. "He actually left the Marines last year because he wanted to be a commercial pilot, but it was just not good timing, so he went back on active duty. He loved to fly. He did what he could to keep flying." The aviator lived in Carlsbad with his girlfriend, Heather Rand, his father said, and will be buried at Arlington National Cemetery. Walsh's family could not be reached for comment. Palombo's wife, who recently had a baby girl, was too distraught to talk at length about her husband, who lived in Carlsbad. "I want everybody to know how good my husband was," Hiroko Palombo said. "But I just can't right now." 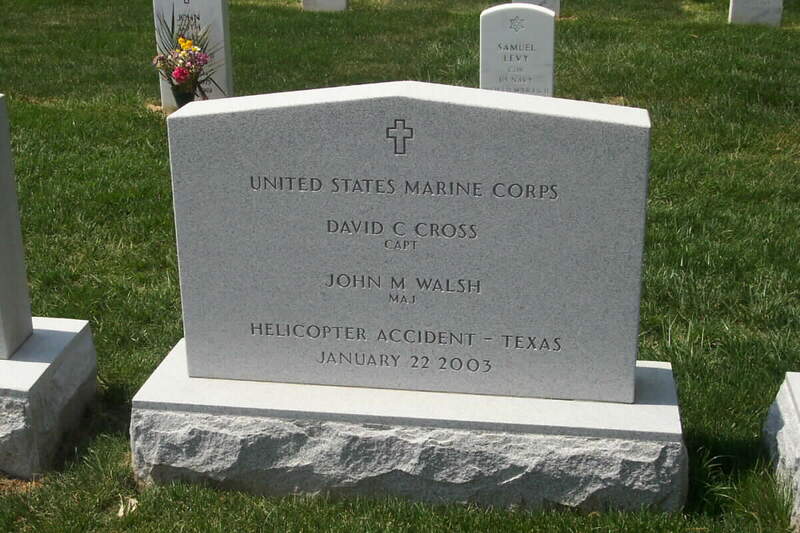 As I reviewed your site today, I noticed an incorrect callsign for Captain David C. Cross. His callsign is posted as "Munpi", but it is in fact "Moon Pie." Captain Cross was one of my best friends and we served in the same Squadron together many years ago, when he was given the callsign Moon Pie. Your site and information was very well done otherwise. Please feel free to contact me with any questions. Thank you for your time. 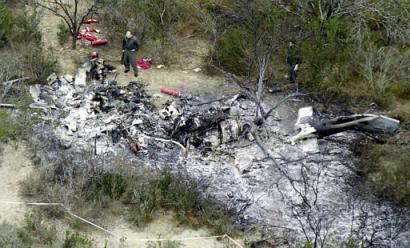 Wreckage from a Wednesday night collision between two military helicopters is strewn over dusty scrubland near the Mexican border in Falcon Heights, Texas. All four Marine reservists aboard died. Armament: One 20mm turreted cannon with 750 rounds; four external wing stations that can fire 2.75''/5.0'' rockets and a wide variety of precision guided missiles, including TOW/Hellfire, Sidewinder and Sidearm missiles. Died on January 22, 2003, when his helicopter went down while on assignment assisting the U.S. Border Patrol along the U.S.-Mexican border in South Texas. David was born in Washington, D.C. on October 11, 1968. He grew up in Alexandria, Virginia, and State College, Pennsylvania. He graduated from the Pennsylvania State University, was a member of the Pi Kappa Alpha Fraternity and held a second degree blackbelt in Tae Kwon Do. David joined the Marine Corps in 1991 and trained as a Naval Aviator in Pensacola, Florida. After receiving his wings, he was transferred to Camp Pendleton in San Diego, California, where he flew and later became an instructor for the AH-1W Super Cobra Attack Helicopter. He is survived by his mother, Gwynn A. 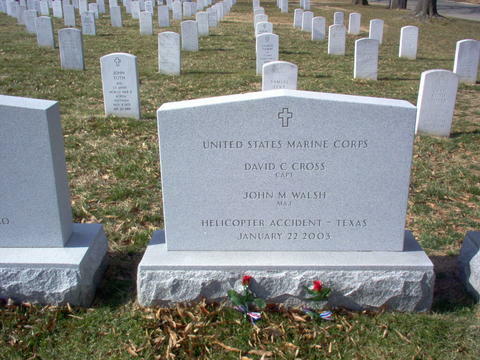 (Dowell) Cross of San Antonio, Texas; his father, David C. Cross and stepmother, Linda L. Cross of Reston, Virginia; his brother, Daniel S. J. Cross of New York City; his long time girlfriend, Heather Rand of Carlsbad, California;aunts, uncles, cousins and many friends. A visitation will be held at the ADAMS GREEN FUNERAL HOME, 721 Elden St., Herndon, Virginia, from 5 to 8 p.m. on February 4. A graveside service with Full Military Honors will be held at 9 a.m. on Wednesday, February 5 at Arlington National Cemetery. Oh, I have slipped the surly bonds of earth and danced the skies on laughter, silvered wings; and while with silent lifting mind, I've trod the high untrespassed sanctity of space, put out my hand, and touched the face of God. Author, John Gillespie Magee, Jr.